We went from doing fairly well this morning to being rushed into a string of tests and procedures and surgery the rest of the day. 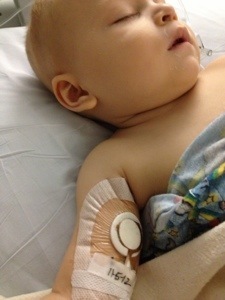 After Kai’s morning meds his blood pressure began to drop. I wasn’t too worried about this as he is on some pretty heavy pain meds but this put everyone else on high alert! 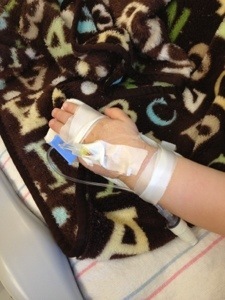 Then we got word that his blood cultures from last night were showing bacteria growth (gram neg. rods). This caught everyone off guard and then, as if on que, his temp came back and everyone was thrown into a panic. All of a sudden we had teams of doctors coming to visit one after another. 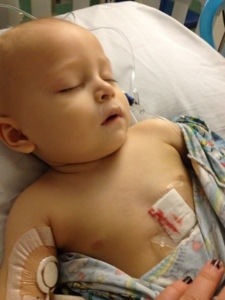 With the now known bacterial infection and his low blood pressure they started talking sepsis. Before I knew it we were transferred down to the ICU for blood pressure meds and closer observation. Then we were having a surgery consult to talk about removing his port. If his port was the source of the infection they needed to get it out ASAP. I was really hope his pressure was med related and that it would stabilize but by 3:00pm it was still low and he was sent down to surgery to have his port removed. The surgery went well and thankfully, while he was still sedated, they were able to place a PICC line that will now be used in place of his port. He came back from surgery groggy but was finally able to relax and rest. The surgeon came down to tell us the port did not visibly look infected which is obviously a good thing, but it also left everyone questioning his shunt. Swabs and pieces from the port surgery were sent to be tested but in the meantime a new plan to rule out shunt infection was getting under way. The first step was to get a CT scan to take a look at the ventricles. In the ICU they were able to bring in a traveling CT machine and he had it done right in his room. He was still groggy from anesthesia but once they moved him to the machine he was clearly uncomfortable again, so the have him MORE sedation. The poor kid has had so many meds today I can’t even keep track! 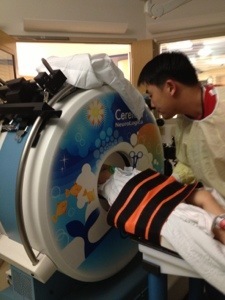 After the CT he was scheduled for a lumbar puncture to test the spinal fluid. This was another in room procedure requiring yet more sedation! The initial thought was that his spinal fluids look good but we won’t know for sure for a day or so. The day was a whirlwind and I am thankful he is now resting and we are treating the infection as best we can. It sounds like we will be here through the week, as usual, but we will see what tomorrow brings. Kerri, Know that my thoughts come with two huge arms to wrap around you and Kai. I hope you have Mark and others with you. I pray for healing for all of you. I pray you will be home soon. No words. Just know we’re praying for you guys and sending lots of love and positive thoughts your way.